As a writer, I’ve learned to love the conference scene. Actually, I’m completely drained by large social gatherings–evidence that I am a legitimate introvert. But here’s why I have evolved to deem conferences worthy of the energy expenditure! This list is in context of a few highlights from Life, the Universe, and Everything 2015 (LTUE), a symposium for speculative fiction authors, which was absolutely awesome this weekend. I woke up today wired with so many ideas for my works in progress. Pretty epic for a Monday morning…! I meet so many interesting writers and other creative people, which is a treat. Case in point, props to author Adam Jordan’s approach to putting a writer’s group together. Awesome! Yes, it’s a relief to get away from that intensity but for a few days there’s just something about having at least some instant rapport and understanding with people. I loved this past weekend’s Life, the Universe, and Everything symposium for this very reason. That’s not to say I don’t feel awkward 50% of the time. Conferences are a nice place to reconnect with talking to real people! Speaking of challenge, I love how LTUE and other conferences offer the opportunity to book “pitch or critique sessions” with publishers and agents. It’s terrifying, yes. But it makes you get that stinking elevator speech, outline, summary, or manuscript done. It’s the best kind of practice, in my book, because it’s not practice. It’s the real thing–well, with training wheels, I suppose. Because everyone I’ve pitched to has been understanding, encouraging, and constructively helpful to me getting better at it. I advocate taking advantage of this at conferences! It’s worth the $10-20 sign-up fee. Even though those 10 minutes will cause you days of anxiety, as they definitely do to me. I got so much awesome feedback from my pitch to Toni Weisskopf of Baen Books. It’s pretty cool to have access to this kind of coaching and input. The writing panel topics are inspiring, and I especially like productivity-focused presentations. I get re-inspired on how to be disciplined about my writing. This weekend, I loved Johnny Worthen’s presentation on writing a novel in 90 days. His energy and sense of humor is so infectious! And the character sourcing is inspiring, too. I get so many ideas just from observing other attendees. If you think airports are great for people watching, you haven’t been to a fantasy or science fiction conference. It really is like a creativity energy-shot. Even conferences focused on writing, like LTUE, draw other artistic forms and I love seeing those creations. 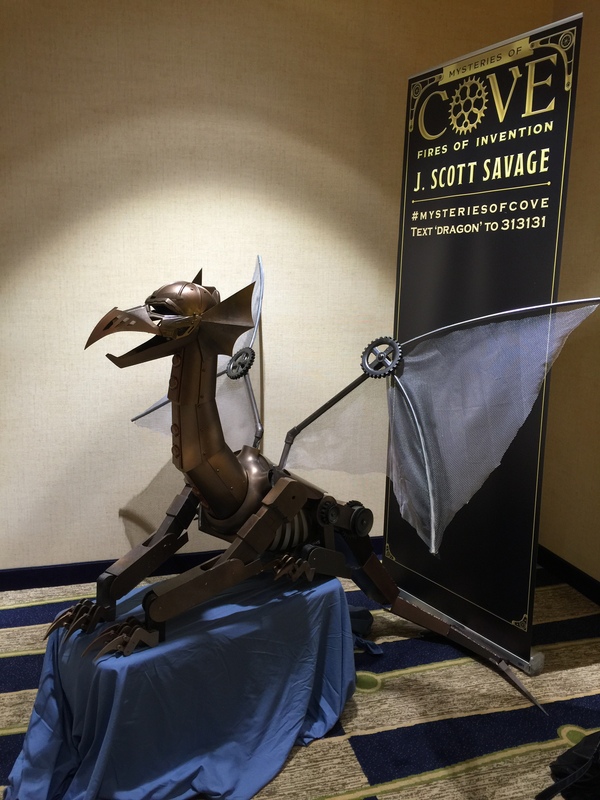 Like this fabulous steampunk dragon by J. Scott Savage! So if you’re a writer, start finding your way to conferences! Even if it’s a stretch. And thanks to my fellow panelists in the Madeleine L’Engle and E. E. “Doc” Smith – Space Travel – Warp Speed vs Tesseract discussion. We covered the far reaches of the galaxy with that one. I loved the audience participation and hope it sparked some creative ideas for everyone. Afterwards, I thought about how we touched on the line between hard science fiction realism and daring to broach the more speculative non-realistic. I know I’m always trying to balance those myself. It’s a fine but fun line to venture along!